Since the introduction of hydrodemolition robots in 1984, the practice of hydrodemolition has been revolutionised, making the sector more versatile, efficient, accurate and safer. At Hydroblast, our Aqua Jet robots are equipped with numerous specialisations. Ranging from a tracked crawler to an extendable robotic arm, previously hard-to-reach areas (even underwater), can now be accessed using these compact and intelligent hydrodemolition robots. Reaction forces in hydrodemolition when not understood can be potentially harmful. These forces occur as a counteraction when high-pressured water is applied to an object. Research and experience has shown that a minimum pressure of 800 bar is required to break up concrete, therefore, the relative reaction force is considerable. When using such high pressures, robotic machinery is preferred to hand lancing as hydrodemolition robots, such as the Aqua Cutter 410a Evolution, can be operated from a safe distance, thereby eliminating the risk of a reaction-force related injury. Robotic hydrodemolition is also safer than its manual counterpart because it is so easy to use. Traditional hand lancing, much like the pneumatic jackhammer approach, can be both monotonous and very demanding. This physically exhausting work not only causes fatigue, but also reduces working time to 10-15 minute intervals and increases the risk of accidents. 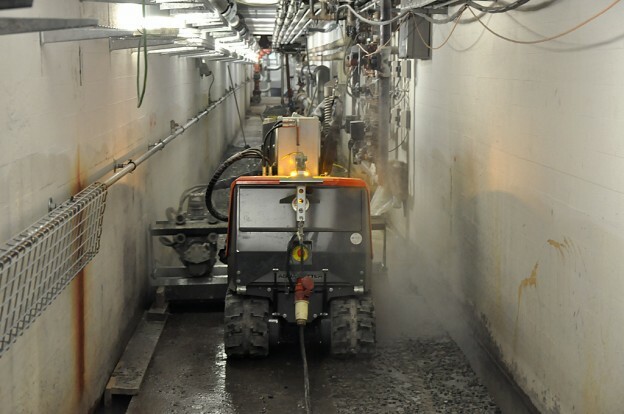 Conversely, hydrodemolition robots can be operated from a control panel, ensuring that the job gets done faster while the operator remains alert and focused. One of robotic hydrodemolition’s many advantages is its ability to efficiently and accurately perform concrete cutting tasks. Through the use of precise, robotic-controlled movements, hydrodemolition robots effectively complete tasks at a fraction of the time it would take to do them manually. At Hydroblast we offer a full range of robotic hydrodemolition services. If you have a project which you would like to discuss with one of our experts, call us on 01677 428 786 or email us at [email protected].